Generally when people say HTML5 videos nowadays, they refer to webm, ogv and mp4 as there is no such a video format that is supported by all HTML5 web browsers so far. In case you have a webm video and want to convert it to other two HTML5 video formats as well. What would you do? 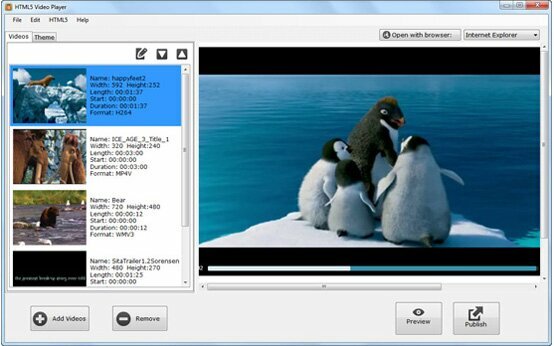 Socusoft HTML5 video player can help you with it. This tool can convert your Webm to MP4 and Ogv videos. However since the video converter will generate three copies of the same video for greatest compatibility on all browsers and devices. Before you converting a Webm to Mp4 and Ogv files, you need to double check your have enough disk space on your hard drive where you save the generated video player. When you find the Webm to mp4 converter get stuck with the video conversion and it never finishes, most likely you may hard disk is out of space. Also we strongly recommend you split long videos into small parts to prevent the long loading time. Keep in mind that your visitors may not have the patience to wait for more than 10 seconds for a video to begin to play.